NEW ORLEANS — Since the start of the 2016-17 collegiate track & field season, four names remained constant on the Men’s Watch List for The Bowerman Award: Edward Cheserek, Christian Coleman, Lindon Victor and Rudy Winkler. Between the first version of the Men’s Watch List – which came out January 5 – and the most recent edition – released Thursday by the U.S. Track & Field and Cross Country Coaches Association (USTFCCCA) – the six other spots have been occupied by 13 men. Grant Holloway and Emmanuel Korir also return from February’s Watch List, but four others did not – Isaiah Harris, Filip Mihaljevic, Byron Robinson and Curtis Thompson. Instead, KeAndre Bates, Mostafa Hassan, Fred Kerley and Chris Nilsen took their spots. Also Receiving Votes: Randall Cunningham (Southern California), Isaiah Harris (Penn State), Julian Harvey (SIU-Edwardsville), Daniel Kuhn (Indiana), Ioannis Kyriazis (Texas A&M), Filip Mihaljevic (Virginia), Clive Pullen (Arkansas), Byron Robinson (Texas). All 10 men on the Pre-NCAA Indoor Championships Watch List will compete in College Station, Texas next week. Some – like Bates, Cheserek, Holloway, Kerley and Victor – will play integral roles in helping their top-ranked teams possibly win a national team title. We’d go alphabetically to break down the Watch List, but the Man of the Hour is Cheserek. The Oregon star recently shattered Lawi Lalang’s indoor collegiate record in the mile with his time of 3:52.01 at the Boston University Last Chance Meet. 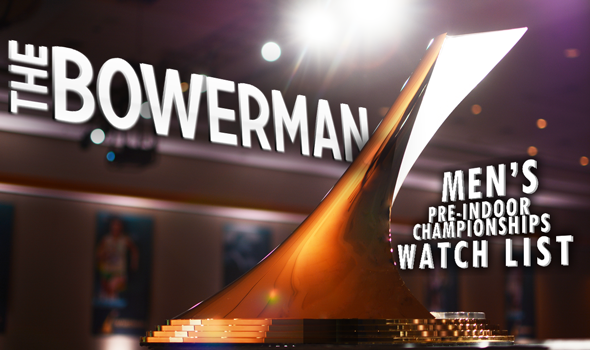 Cheserek also tied Lalang’s record for most appearances on the Watch List in the history of The Bowerman Award (24). King Cheserek is entered in three events at the upcoming NCAA meet – the mile, 3000, 5000 – and could possibly quadruple if the Ducks want him in the DMR. Like Cheserek, Kerley waged an assault on the record books in his own special way. It was at the SEC Indoor Championships where Kerley ran the 4th fastest time over 400 meters in collegiate history (44.94). Kerley also anchored Texas A&M’s 4×400 relay that lowered its own collegiate record to 3:02.39. Let it also be noted that Kerley ran the 5th fastest time over 400 meters in collegiate history back in mid-February (45.02). Bates earned his spot on the Watch List large in part to his performance at the SEC Indoor Championships. The junior swept the horizontal jump titles and took down the national leader in the triple jump. Bates is currently ranked 2nd nationally in the triple jump (16.81m/55-2) and 3rd in the long jump (8.05m/26-4½). Coleman has been his normal, steady self. The Tennessee junior notched two more sub-6.55 times in the 60 in a winning effort at the SEC Indoor Championships and lowered his indoor 200 PR in mid-February at the Clemson Tiger Paw Invitational (20.46). Hassan booted Mihaljevic off the Watch List and did so as the national leader in the shot put. The junior from Colorado State has more than two feet on the runner-up at the moment (69-10¾ versus 67-2) and is the 10th best performer in collegiate history. He is the first athlete from Colorado State to be named to the Watch List. Holloway – Florida’s precocious freshman – remains the national leader in the 60 hurdles (7.58) and sits 2nd in the long jump (8.05m/26-5). He’ll compete in both events at NCAAs and also offer his hand in the Gators’ 4×400 team, which is currently ranked 2nd behind Kerley’s Aggies. Korir will have his work cut out in the open 800 at NCAAs as he’s one of six men seeded under 1:46.50. He will also compete as part of UTEP’s DMR, which enters ranked 10th. Nilsen, a freshman, is the national leader in the pole vault and cleared 5.70m (18-8¼) earlier this season at the Tyson Invitational for the American U-20 indoor record. He will be one of 11 men at NCAAs who have vaulted over 18 feet this season. Nilsen is the first male athlete from the University of South Dakota to be named to the Watch List. Victor enters NCAAs with the 5th best score in the heptathlon this season. He notched a total of 5851 at the SEC Indoor Championships in a runner-up effort (Georgia’s Devon Williams won the event with a score of 6047). Winkler found his groove as the season wore on and enters NCAAs 3rd in the weight throw. He’ll look to improve upon his 10th place finish from one year ago. Eight men received votes to be on the Watch List, but didn’t have enough to gain a spot on it: The aforementioned trio of Harris, Mihaljevic and Robinson to go along with Southern California’s Randall Cunningham (national leader in the high jump), SIU-Edwardsville’s Julian Harvey (national leader in the long jump), Indiana’s Daniel Kuhn, Texas A&M’s Ioannis Kyriazis and Arkansas’ Clive Pullen (national leader in the triple jump). The next Watch List will come out March 16.